The New York Jets playmaking safety absolutely can’t stand losing, and the team’s embarrassing 41-10 defeat at the hands of the Matt Barkley-led Buffalo Bills on Sunday stung him. The Jets (3-7) have lost four straight as they hit the bye week with speculation surrounding the future of coach Todd Bowles, who appears will remain in his job for now. Beyond this season, however, would seem unlikely. Adams has been vocal in his support of Bowles, repeatedly saying it’s on the players to execute on the field. 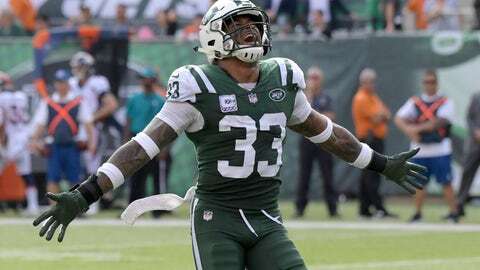 He said in an interview with Bleacher Report during the offseason that when he arrived to the team as a first-rounder out of LSU, there was a questionable culture surrounding the Jets in which they were used to losing and not everyone put out a full effort. He was asked on WFAN’s “Carlin, Maggie & Bart Show” if that culture had changed, and Adams pulled no punches. It would be difficult for Adams to spin anything in a positive light when the team has seven losses, and he again made it clear he fully supports Bowles. But, his remarks certainly won’t help his coach in the eyes of the Jets’ brass. Adams acknowledged that the Jets prepared during practice last week to face rookie Josh Allen as Buffalo’s starting quarterback — despite Allen missing the three previous games with an injured elbow — and there was little film on Barkley, the fourth-stringer who wasn’t named the starter until Saturday. Barkley, who hadn’t played since the 2016 season finale while with Chicago, threw two touchdown passes to lead the Bills to a rout. Adams acknowledged that he didn’t have his best performance, but said the Jets lacked energy in the game and he saw “people were down” on the sideline. But he wouldn’t say whether he thought the team quit Sunday. “Just know one thing: As long as I’m on the team, I will not let that happen as best I can, and I damn sure won’t quit,” Adams said. He also added that he spoke to teammates at halftime — “there were definitely some words said” — when the Jets were trailing 31-3. Adams is generally considered one of the main emotional leaders on the team, despite being in just his second season. He said he was heading home to Louisiana for a few days before the team gets back together for work next Monday. “A lot of frustration, a lot of emotions,” Adams said. “I’ve got to be around family, man. I’ve got to get down south and just clear my mind. I’m not going to sit here and say I’m happy. I’m not happy with what’s going on. Obviously, no one is in the building. I always say this: I classify myself as a winner no matter what. It’s very tough to go out there and come up short.